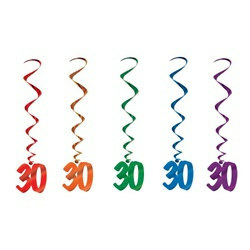 Celebrate a 30th birthday or 30th anniversary of your company with packs of 30th Whirls (5/pkg). These fun and colorful dangling decorations make the perfect accent to your ceiling decorations and will coordinate with many of our 30th products. We also carry special 30th centerpieces, pins, streamers, confetti, and napkins. Great fun ceiling decor that adds spice! much bigger than they look in the picture, but that is a good thing! sturdy, held up well, and were a great decoration!